David Barber is a fascinating speaker and great personality in the arctic ice world. His TED talk here dovetails nicely with the Stanford Research on Extreme weather profiled today, and yesterday’s piece on the risks of new Arctic Drilling. If you are pressed for time, start at 9:14 for a paradoxical surprise – decrease in sea ice coincides with increase in hazards, due to new kinds of very unpredictable ice dynamics. Ironic and very significant for those interested in exploiting the melting Arctic, no? At 11:05 there is a discussion of arctic effects on global jet stream circulation and weather patterns. 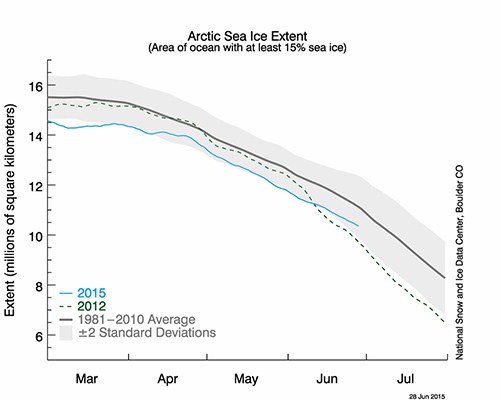 In March, Arctic sea ice reached the lowest maximum extent on record. That in itself is probably not an indicator of what the ice will do this summer. Far too much variability in the arctic system to characterize this early. The dotted line in the graph represents the course of the record low 2012 season, and you can see that for much of the spring, this year’s ice (blue) has tracked below that, recently poking somewhat higher. But the melt season is upon us, so I’ll be checking and updating regularly. In the graph above, which is current as of this posting, you can see the March Low Maximum, as well as the course over the last few months. I’m guessing that it won’t be till the second part of August that we’ll have a clear picture of what this year”s minimum will bring. Thanks for sharing that eye opening TED talk which was very well presented by Dr David Barber of the University of Manitoba. Seems there are more reasons than purely financial for oil exploration companies to consider. An oil rig would be no match against an armada of approaching icebergs.